In an effort to practice what I preach, I took a few minutes out to reflect on my GIE+EXPO 2016 experience and, specifically, to identify my most important takeaways. Hopefully, you have completed this valuable exercise by now. If not, perhaps this blog post will inspire you to do so. Here are five lessons learned at this year’s event. Lesson 1: Don’t over-schedule. While it’s important to have a plan, be sure to leave time for impromptu conversations and be flexible enough to adjust your plans if necessary. My most significant opportunities were a result of simply having time and being open to meeting new people. If I had scheduled every minute of every day, not only would I have been way more stressed, but I would have missed out on some great things. Lesson 2: Don’t burn the candle at both ends. This is a show that seems to never end, which is great. But it’s easy to go beyond your physical and emotional limits. Know what these limits are and don’t be shy when it’s time to say goodnight. You’ll be glad you did in the morning and for the duration of the week. Once you find yourself in a deficit, it’s difficult to climb out of the hole. Lesson 3: Avoid the drains. With all due respect to GIE+EXPO attendees, some people drain your energy, while others fill up your tank. 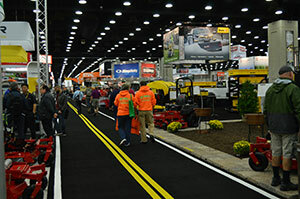 This is a huge trade show with plenty of options. Without being impolite, simply avoid these people. Spend your time with those who inspire you, make you laugh and who help you be a better person. You know who falls into each category. Lesson 4: Keep good notes. Great ideas are lost and opportunities are missed when we fail to capture them in writing. I’m normally very good at this but I have to admit that I returned home with a business card from a person who I couldn’t place. Without a note, I had no option but to contact this person to solve the mystery. Thankfully, we figured it out and I have a new friend and a story to laugh about. Lesson 5: Follow up promptly. As busy as our lives are, if we wait a week or more, it’s unlikely we will remember the great conversation we had with a new friend at GIE+EXPO. I have made it a habit of sending follow-up emails during the trade show in order to keep up, and then finishing all follow-ups no later than the Tuesday following the show. Waiting any longer is not only detrimental, it’s unprofessional. After putting these lessons from GIE+EXPO in writing, there is no reason for me to apply these lessons only to this trade show, as they apply to many other situations as well.